The speed bag is considered by many to be a boxer’s best friend. The speed bag is one of the most fun boxing workouts once you learn how to do it. Some people are afraid of the thing, because when you first start with the speed bag, you will look a little awkward. 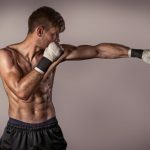 Do not worry about how you look at first though, because every boxer has experienced that at some time or another and the benefits are amazing. For the purpose of utilizing the speed bag properly we will discuss those benefits, teach you how to use it and take you step by step through five awesome speed bag workouts. Shoulder and Arm Endurance – The quick and constant movement involved with speed bag training is a great endurance booster for these muscle groups. Hand Eye Coordination – It can be tricky and awkward when you first try out the speed bag, but stick with it and you will have an incredible command of the accuracy of your punches. Timing – Once you get the hang of it, you can change speeds and work the bag at any speed you want which improves your timing and hand eye coordination. A variation on the speed bag is the double end bag, these have more movement allowing you to work in punch combinations. Punching Speed – It is called a speed bag for a reason. The bag swivels and rebounds off the board as fast as you can hit, forcing you to keep pace and rhythm. Punching Power – Most beginning boxers associate developing punching power with the traditional heavy bag. Many people do not realize what speed bag workouts can do for power punching, but speed equals power, just ask 20-year old Mike Tyson! A speed bag is a small swivel mounted punching bag that gets inflated with air and attached to a horizontal backboard. Large size speed bags are designed for developing strength and endurance, and a small speed bag is best for improving your hand speed, timing, and hand-eye coordination. You can punch a speed bag in a variety of ways, but it’s most common to start out by simply hitting it from the front with both the fronts and sides of your fists. After you have had a lot of practice, you can start to incorporate punches from all sides of the speed bag, including your elbows. The best thing to do when you are starting out is to go slower and develop a rhythm and punching coordination. Many people do this by playing music and punching with the beat. Here is an excellent instructional video showing you exactly how to punch a speed bag. A speed bag is small enough that it can be mounted on the wall in your garage or home boxing gym. The rest of the gear needed for speed bag workouts is pretty basic. Boxing Shoes – Good shoes help to promote your footwork, which you should be working on as you work the speed bag. Hand Wraps – Wraps cushion the skin and bones in your hands from the repeated blows to the speed bag. It’s always a good idea to wrap your hands for speed bag workouts. Speed Bag – Naturally, you’ll need an actual speed bag to do these workouts. Try it out at your gym if they have one, but it’s also really easy to mount one in your home. Timer & Music – You’ll need a timer to keep track of rounds and sets in each workout, and the music helps provide a beat to punch with. This workout teaches you to throw power punches faster. Boxers like Tyson and Muhammad Ali focused on this workout, especially Tyson who used this routine to help himself punch with the speed of Muhammad Ali while hitting as hard as Jack Dempsey and Sonny Liston. Inflate your speed bag just enough to get rid of any creases in the leather. Get into your fighting stance. Punch the speed bag as hard as you can and count how many times it hits the backboard. If your number is four, practice continuing to get four rebounds. Hit the bag ten times with each arm and try to keep getting four rebounds. Do a total of three sets with each arm while still aiming for four rebounds. 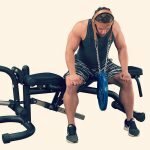 Add a fifth rebound and do six sets with both arms. Continue until you are up to seven rebounds and stop at a total of 24 sets. When you get to the higher numbers of rebounds it will be tempting to wind up your punch. Do not do this. Always punch from your fighting stance and keep your hands up. This exercise is like the power workout except this time you are training to throw higher quantities of regular punches to increase your hand speed. Set your timer to 30 seconds. Punch at a medium pace. Count how many times you hit the bag in an interval. If the number was 40, aim to hit the bag that may times again for another 30 second round. Increase the number by one for eight rounds, one extra punch per round. Keep your hands up. In the ring as soon as you drop your guard you are out of there; knocked out. So always, with every punching routine, keep your hands up and punch from your fighting stance. Speed bag workouts are great for building endurance, both cardiovascular and in upper body strength. You are in constant motion during the speed bag routine, and your shoulders and arms will definitely feel the burn. Here is a good speed bag workout for beginners, where you can increase the minutes as you get stronger and better for improved endurance. Watch the amazing Manny Pacquiao go through a 5 minute set on the speed bag. Now you won’t be attacking the bag just like Manny, he’s a professional with years and years of training under his belt. Just watch his hands and eyes, as well as his feet as he burns through the workout. Punch the speed bag for an entire minute at a fast but steady pace. Take notice how quickly the fatigue hits you. Do five sets of 1 minute each, with 15-30 seconds of rest in between. Every set, try to increase the amount of time you can punch. Continue over the course of a few weeks until you can reach a goal of three minutes at high intensity. Do not get discouraged. The greatest boxers of all time started out the same way and felt drained from punching the speed bag. Keep your hands up and punch out of your fighting stance. This exercise teaches you to land your punches where you intended. You will get the most benefit from this routine when using a small sized speed bag. Hit the bag in the exact center spot, so that it rebounds in a straight line. Try hitting different spots on the speed bag without messing up your rhythm. Do this and circle the bag in small steps, keeping your rhythm. Do this in several 30 second round working up to the number of sets you can do before being too fatigued. There seems to be a division with MMA fighters as to how useful a speed bag actually is for an MMA fighter. What we can tell you is when used correctly, speed is every bit as important in MMA as it is in boxing. The speed bag teaches you to keep your hands up in the defensive position for an entire round. Rejoice if your opponent isn’t working a speed bag because you can throw several punches to their one. Also useful to MMA is the double ended speed bag so that fighters can mix in kicks and get out of the way. As far as specific speed bag exercises for MMA, where punching is concerned follow the same steps as in the other workouts.